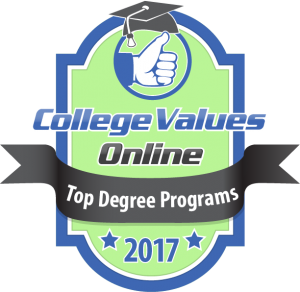 Our Ocean Sciences program is among the Top 10 Values in Oceanography. 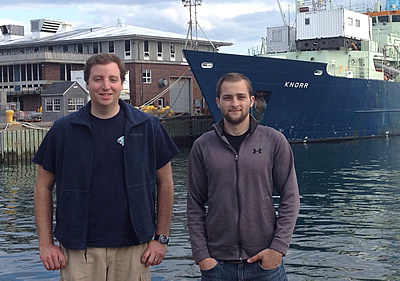 Dr. Robert Vaillancourt, Evan Ntonados (OSCS/MET) and Jeremiah Stone (BIOL/OSCS) participated in a NOAA-sponsored project, the West Atlantic Climate Study (WACS II) aboard the research vessel (RV) Knorr, a 279-foot global class research ship, from May 18 to June 7. The focus of WACS II was to determine the links between surface ocean phytoplankton and the production of freshly-emitted sea-spray aerosols, organic compounds produced by phytoplankton that are then ejected to the lower atmosphere and impact Earth’s climate by attenuating incoming solar radiation and providing cloud condensation nuclei. The multi-investigator study site extended from just south of Nova Scotia Canada to the waters around Bermuda, and was headed by NOAA scientist Dr. Patricia Quinn, of the Pacific Marine Environmental Laboratory, Seattle WA. The Millersville University contribution was to measure phytoplankton biomass and species composition in the ocean’s upper mixed layer. Members of the Submersible Research Team prepare to survey the Chincoteague Channel to study sediment transport in the area. Members include Geoinformatics graduate student Nathan Murry, undergraduate students from Ocean Sciences and Coastal Studies (OSCS) and Applied Engineering Science and Technology (AEST), Amanda Hardin and Michael P. Wiles. Dr. Joseph McCade (AEST) and Dr. Ajoy Kumar (OSCS) are the faculty advisors. The M3 sonar system used for the survey can be seen on the right side of the picture. Here, Melody Aleman is seen collecting water samples aboard the research vessel R/V FALKOR in the South China Sea. The study is part of a NSF funded program: A changing river: measuring nutrient fluxes to the South China Sea. Melody plans to do an undergrad thesis with data collected from this cruise under the supervision of Dr. Ajoy Kumar at Millersville University and Dr. Ajit Subramaniam from Columbia University, New York. Ocean Sciences and Coastal Studies (OSCS) majors Cara Geiger and Angela Ditri at the Ocean Sciences Conference, New Orleans, Louisiana, 2016. Students from the Submersible Research Team deploying the submersible “Dora” in the waters off Wallops Island. The submersible is used as part of a program to study the marine life at the Black Fish Reef off Assateague Island National Seashore. A study by Marine Biology and Ocean Sciences and Coastal Studies (OSCS) students to capture and tag sharks to determine if there is any seasonal pattern in abundance and species composition of sharks off Assateague Beach, VA. This study is led by PI Zoe Zenter and Co-PI’s Benjamin Cox, Kamila Skiba, Matt Hamilton, Luke McConvile and Ryan McGonagle. Faculty mentors are Dr. Dominique Didier (Marine Biology) and Dr. Ajoy Kumar (OSCS). MU's Ocean Sciences program is among the Top 10 Values in Oceanography.